Just a collection of the charts from Blueholme, plus a new chart listing all the monsters with Size, AC, HD, Movement, Damage, Align, Treasure, Page; that's super helpful for a game with some weird monsters. The front and back covers don't show up in Preview or Skim on Mac, only in Adobe's reader (ugh), but the clean art version does on page 3, and the interior seems to render fine. There's some scaling & half-toning artifacts in a few pieces, some of which are rendered differently but also wrong in Adobe. I think the editor needs to ship printable and screen versions. There may be too much whitespace and large fonts. Holmes was Futura 10 or 11pt, mostly tightly-packed paragraphs; maybe that's too small for quick reference sheets, but this goes too far the other way. The art's great, though. Like the main book, it has the tone of the original Holmes boxed set, but modern artists. You could make a home-made Referee screen out of these pages, but you'd have to do some editing: Pages 16-17 are the combat charts, but Turn Undead is buried with the classes on page 7, and page 11 has the movement & getting lost charts. ★★★½☆: It's a buncha charts. 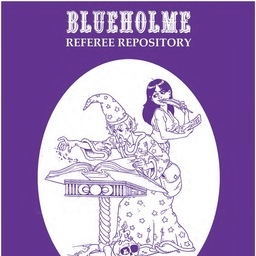 Coincidentally, I'd been thinking about and writing some notes for using Blueholme in a Discord or Skype chat game, so this comes at a good time.